In pursuit of a healthy cuisine, chefs are adding vegan dishes to their menus. Eliminating all animal products? That raises flavor concerns for some diners. 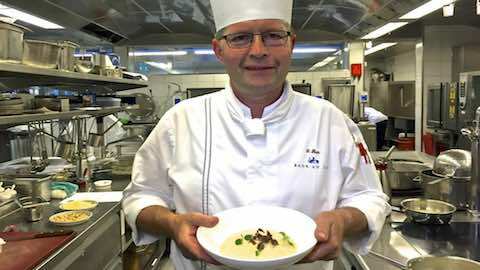 Comfort food, says Swiss chef Olivier Rais, helps make that transition. At Rive Gauche, Rais focuses on grilled meats and seafood, the mainstay of the restaurant in Hotel Baur au Lac across the street from Lake Zurich. Vegetarian dishes have long been popular in Switzerland. Hiltl, the first vegetarian restaurant in Europe, opened in Zurich in 1898. Rais always served elegant vegetarian dishes, but putting vegan dishes on the menu seemed like a bridge too far. Trained in classical French and Italian cuisines, he had always relied on butter and eggs when he made savory dishes and baked goods. Everything changed when he worked with chef Tal Ronnen at Crossroads Kitchen in Los Angeles. Ronnen showed him how to employ plant proteins as emulsifiers to replace eggs and nut purees, margarine and nondairy cheeses instead of butter, milk and cream. Enjoying the playfulness of vegan substitutions, Rais' face lights up when he talks about creating a dish that appears to be roasted bone marrow but is actually a heart of palm stalk with a porcini mousse filling. He was especially proud of a juicy vegan burger he made with dehydrated and smoked mushrooms mixed with beets, barley, broccoli and coconut oil. When I visited, Rais served a watermelon-tomato gazpacho, sous vide carrots with cumin and ravioli made with tofu "skins" filled with dried tomatoes and zucchini sauced with watercress coulis. Visually gorgeous, the dishes were delicious. Rais admits that preparing vegan dishes requires more labor and expense. In the U.S., vegan products are more readily available than in Europe. In Zurich imported vegan ingredients are difficult to locate and more expensive than local, animal-based products. Rais hopes that his diners will support the higher cost of the vegan dishes he has added to the menu. In the meantime, he offers dishes like the risotto in the traditional style using butter and Parmesan cheese as well as a vegan dish without dairy products. And, of course, he will continue to serve a full menu of grilled meats, poultry and fish prepared on the kitchen's powerful 800 F grill. Ultimately, by serving vegan dishes Rais can now offer a menu that delights all diners, whatever their preferences. Short-grained Arborio rice should be used because it creates the creaminess associated with good risotto. Another rice can be used, but the risotto will be less creamy and the result can be more like porridge. In the U.S., vegan products are available in upscale supermarkets and health food markets. The vegetable stock, cashew butter and fennel puree can be prepared the day ahead so the cooking of the risotto can be accomplished quickly and easily. Homemade vegetable stock is preferable to using powdered stock. To make vegetable stock, put a gallon of water into a large pot with two cups each of chopped tomatoes, carrots, celery, onions and mushrooms. After boiling uncovered 45 minutes, the stock will reduce by half. Strain with a colander or run through a food mill. Reserve stock in an airtight container and refrigerate. Whatever is not used for the recipe, freeze in pint-sized containers for later use. 1. To make the cashew cream, cover raw cashews with water. Soak overnight. In the morning, place cashews into a blender. Add small amounts of water as needed to create a creamy puree. Refrigerate in an airtight container. This step can be done a day ahead. 2. Roughly chop raw fennel bulb. Place cut-up fennel in a steamer pot with 3 cups water. Cover and steam until soft, 2 to 5 minutes. Remove and cool. Puree the steamed fennel. Refrigerate in an airtight container. This step can be done the day ahead. 3. In a small pot, heat vegetable stock on a low flame and set on the back of the stove top. 4. In a large saucepan or sauté pan, heat olive oil on medium-low heat. Add finely chopped shallots. Stir and sauté until soft. Do not brown. 5. Add Arborio rice to shallots. Stir well and sauté until rice is almost translucent. 6. Add white wine. Simmer. Stir well until the wine is reduced by half. 7. Add 1 cup vegetable stock. Stir well. When the liquid is absorbed, add another cup of stock. Season with sea salt and freshly ground black pepper. 8. Continue adding stock, 1 cup at a time and stir. As the rice absorbs the liquid, the kernels will soften. Continue adding stock and simmering until the kernels are al dente. 9. Stir frequently to prevent the rice from burning on the bottom of the pot. 10. Mix in 3/4 cup cashew cream and 1 cup fennel puree. Stir well to incorporate. 11. Add vegan margarine and incorporate. 12. After margarine melts, add vegan cheese. Stir until cheese melts. 13. Core and peel the apple. Make a very fine dice yielding 1/4 cup. Add to risotto and mix well. 14. The risotto should be creamy. If rice begins to dry out, add small amounts of stock as needed and mix well. 15. Taste and adjust seasoning with sea salt and freshly ground black pepper. To counter the creaminess, if desired, add a small amount of dry white wine. 16. Portion risotto into four plates. Garnish with a drizzle of balsamic vinegar, sprouts, herbs and edible flowers like baby pansies or with finely chopped Italian parsley (optional).